Solving an inequality with a constant means finding values for x in terms of the constant that make the inequality true. Solve each inequality in terms of the constants: a, b and c.
To enter the constants a, b, and c, use the a-z keyboard. To enter y as a variable, tap the x variable key twice. 1) Enter the expression: 2x + a > 5. 2) Enter the expression: 3y - 2b + c < 0. 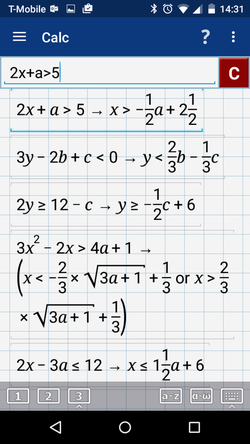 3) Enter the expression: 2y > 12 - c as "2y >= 12 - c."
4) Enter the expression: 3x^2 - 2x > 4a + 1. 5) Enter the expression: 2x - 3a < 12 as "2x - 3a <= 12."